At the corner of Fremont and 6th Street, on what’s known as fabulous East Fremont in Downtown Las Vegas, the strip of unpretentious, yet masterful and reputable bars filled with a perfect mix of locals and tourists alike, you will find a long-standing and well-known neighborhood favorite, which is Commonwealth. Anyone who’s enjoyed an evening out with friends within their walls, or danced their inhibitions away upon their rooftop will tell you that Commonwealth is a must when it comes to your average Downtown Las Vegas bar crawl. 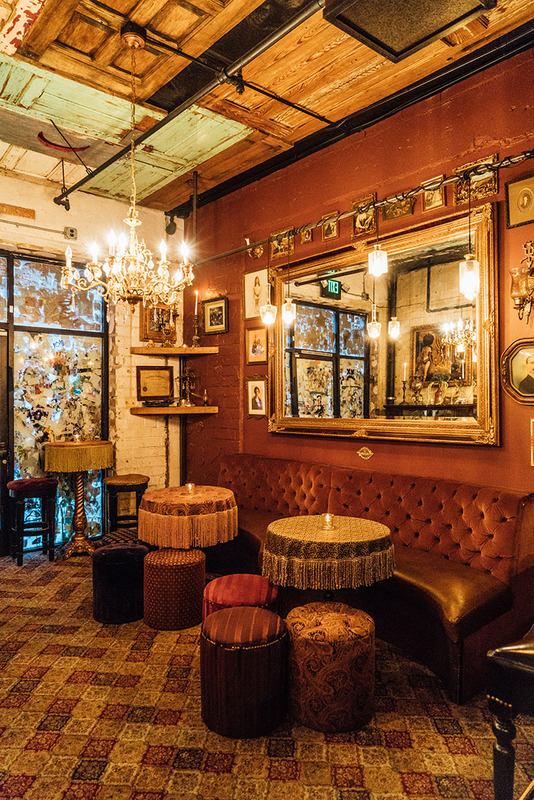 What many of you may or may not know, is that tucked within the beautifully decorated innards of Commonwealth is a Speakeasy-style goldmine by the name of The Laundry Room. Open since 2012, by reservation only through their text line, you are given instructions as to where and how, all you have to do is provide them with the when. As you meet with your hostess and commence your experience, you’ll notice that you’ve entered what seems like a different dimension in comparison to Commonwealth’s overall vibe and interior, or even a different time for that matter. The hosts provides you with the rules: No texting or photos, and no PDA, so save the canoodling for another leg of your evening. The good news is, once you’re inside, it’s hard to focus on much else than the exquisite experience before you. Recently The Laundry Room unveiled a new menu including over 40 elaborate craft cocktails all priced at $16. Yes, you read that correctly, 40 craft cocktails! With classic themes in mind, along with some mind-bending concoctions of the 21st century, it would be mighty hard to find something that doesn’t make you fall head over heels with this program. We were happy to enjoy some of these delicious libations for ourselves on a liquor-driven journey along with master bartender, Anthony Partridge, who is the creator of each and every cocktail on their menu. Needless to say, we were absolutely taken aback. First Anthony unveiled to us Bank Statement, a smooth, citrusy, and herbaceous treat to make any gin drinker’s ears perk up. Bank Statement is made with cucumber, basil, lime, Velvet Falernum for that mildly spicy bite of clove and citrus, and none other than London Dry Gin to construct it’s backbone. Next, a treat so nice they named it twice, Pom-Poms. A tropical little devil that won’t pierce you with its pitchfork, this balanced and vivacious beauty is made with pineapple, lime and pomegranate juices, Atlantica Light Rum, and just enough Pernod Anisette to hug your palate. Third, another delectable drink for all of you gin lovers out there, Old Englishman Came Home. This old Englishman is made with White Port, barrel-aged gin, and bright, vegetal ingredients like Cynar, and cardamom and celery bitters. Last, similar to a variation of the Manhattan, Not Another Meat Hook is stirred and served, made with Angostura and orange bitters, Carpano Antica, Luxardo Maraschino, and both a Peat and Blended Scotch for that intoxicating smokiness. If you’re looking for an adventure unlike any other in the Las Vegas Valley, send a text to their reservation line at (702)701-1466 and get started. The rest is up to The Laundry Room! Submit to their little slice of exclusive paradise 7 days a week from 7pm-1am! Remember, dress to impress!